There are 48 achievements or trophies for you to acquire in the original Red Dead Redemption game. The game was originally listed with 35 known and 13 secret ones. However, after the release of the game, "On the Trail of de Vaca" was a known one leaving 12 secret ones to discover. In addition to the other trophies, PlayStation 3 users also have the Legend of the West trophy for obtaining all other trophies. Complete Twin Rocks, Pike's Basin, and Gaptooth Breach Hideouts in Single Player. Kill and skin 18 grizzly bears. Break the Kentucky Saddler, the American Standardbred, and the Hungarian Half-bred. Get 250 headshots in any game mode. Capture a bounty alive. Complete Tumbleweed and Tesoro Azul Hideouts in Single Player. Purchase a rare weapon from a gunsmith. Knock someone out in melee in every saloon in the game in Single Player. Use a Pardon Letter with more than $5,000 Bounty in Single Player. Obtain Legendary rank in any Single Player Ambient Challenge. Earn a Gold Medal Rank for a combat mission in Single Player. Be on the winning team for four consecutive victories in any team based game in public matches. Complete all Hideouts in a single public Free Roam session. Obtain the Elegant Suit. Win over 2,000 chips in a hand of Poker or Blackjack. Get from Blackwater to Escalera before sundown in a public Free Roam session. Reach the top rank for multiplayer experience. Kill 500 enemies with any pistol or revolver in any game mode. Complete Fort Mercer and Nosalida Hideouts in Single Player. Kill 500 enemies with any rifle, repeater, or shotgun in any game mode. Attain highest Fame rank and either highest Honor rank or lowest Honor rank. Earn $10,000 in Single Player. Maintain a max wanted level for 10 minutes and escape alive in a public Free Roam session. Kill 500 enemies with a mounted weapon in any game mode. Complete a game of Liar's Dice without losing a single die. Complete 15 tasks for Strangers. Create a posse and get the maximum number of members. Kill a Rockstar or someone with this achievement in a public multiplayer match. Attain 100% in the Single Player Game Completion stat. Get 10 assists in a single Hideout in a public Free Roam session. Complete a task for a Stranger. Get a headshot while in Expert Mode in Single Player. Be the top scoring player in any three consecutive FFA games in public matches. Kill one of every animal species in the game in any game mode. Get a ringer in a game of Horseshoes in any game mode. 12 secret ones listed below! + On the Trail of de Vaca - Uncover every location on the map in Single Player. That Government Boy - Complete "Exodus in America". Land of Opportunity - Complete "The Assault on Fort Mercer". Sons of Mexico - Complete "The Gates of El Presidio". No More Fancy Words - Complete "An Appointed Time". A Savage Soul - Complete "At Home with Dutch". The Benefits of Civilization - Complete "And the Truth Will Set You Free". Into the Sunset - Complete "The Last Enemy That Shall Be Destroyed". Nurture or Nature? - Complete "Remember My Family". Dastardly - Tie up a woman, place her on train tracks, get her run over. Manifest Destiny - Kill the last buffalo in the Great Plains in Single Player. Spurred to Victory - Complete 20 story missions without switching to a new horse at a hitching post. Heading South on a White Bronco - Evade the US Marshals while riding the Hungarian Half-Bred horse in Single Player. The downloadable content (DLC) for Red Dead Redemption added more achievements and trophies. 2 Guys, 1 Coop - Complete a co-op with just 2 people. Bulletproof - Complete a co-op without dying. Dodge This - Advanced co-op killstreak of 10 kills. Friends Indeed - Complete a co-op without anyone dying. Have Posse, Will Travel - Complete all co-ops. The Mother Lode - Gold medal all advanced co-ops. Stake a Claim - Gold medal a co-op. Struck Gold - Gold medal all co-ops. Well Done - Complete a co-op. You Rule! - Complete all advanced co-ops. Axe Master - Complete all Tomahawk challenges in Single Player. Call it a Comeback! - Come back from a 2-0 deficit and win a Hold Your Own game. Double Bagger - Double capture 3 times in a single Gold Rush map. Hail Mary - Get a kill greater than 35 yards with a Tomahawk. Headhunter - Kill 5 players via headshot in a single Shootout or Gang Shootout. Legendary - Reach level 50 and pass into Legend. Original Gunslinger - Get 25 Deadeye kills with Red. Reeeeal Good - Get 25 Dynamite kills with Pig Josh. Stick and Move - Get 3 kills with knives or throwing knives in a single competitive match. Who Needs Deadeye? - Kill 3 or more players in a standoff or showdown. Good Call - In a single Multiplayer Liar's Dice game, successfully make a spot-on call. In a Van Down By The River - In a Multiplayer Poker game, win a hand on the last card when you were losing prior. Legion of Boom - Get a triple kill while on the attacking team in Stronghold. Master Exploder - Complete the Explosive Rifle Single Player Challenge. One Die to Rule Them All - In a Multiplayer Liar's Dice game, win with only one die left. Pa-Pa-Pa-Poker Ace - In a full Multiplayer Poker game, beat the table when blinds are at maximum. 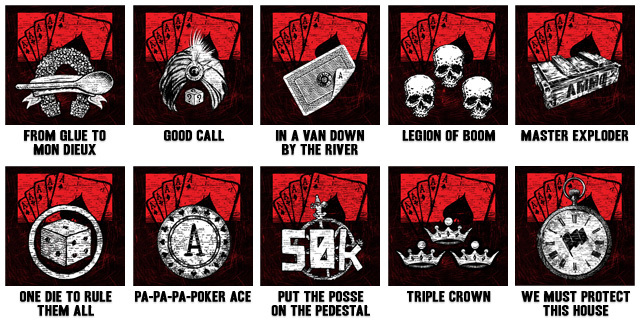 Put the Posse On the Pedestal - Attain over 50,000 posse points in a single Free Roam session. Triple Crown - Get first place In all Races In a Grand Prix In the Races playlist. We Must Protect This House! - While on defense, do not allow the attacking team to capture any of their objectives. Avatar of Death - Successfully complete either round of a Stronghold map without dying. Compulsive Liar - In a full Multiplayer Liar's Dice game, win without losing a single die. Over 9001 - Attain over 9,001 points in a single Free Roam session. Peacewalker - Finish a single race without getting shot or killed, and without shooting a bullet. The Big Bluff - In a Multiplayer Poker game, win a hand by forcing someone with a better hand to fold. Kingpin - Fight off 8 unique players during your reign on top during Land Grab in Free Roam. Mad Marston: The Trail Warrior - Attain Rank 5 in all Undead Challenges. Smoke that Skinwagon - Make it to wave 15 in Undead Overrun Gametype in Multiplayer. Spinning Plates - Have every territory saved at the same time during the Undead Nightmare. Zed's Dead, Baby - Attain 100% Game Completion in Undead Nightmare. The Downward Spiral - Complete Curious Tales from Blackwater, USA” Survivor Mission. Judge A Man By The... - Complete “Cure for Most of What Ails You” and “Get Back in that Hole, Partner” Survivor Missions. The Superior Dance - Complete “Mother Superior Blues”. All’s Right With the World - Complete “On a Pale Horse”. Six Years In The Making - Find and kill a Sasquatch. Chupathingy - Find and kill a Chupacabra. Fan Service - Find and break a Unicorn.